The Ctrl-C is a high quality, full colour 3D scanner. Enabling hobbyists and businesses to create immersive 3D content with their own digital camera. The scanner was designed for my final year project at Loughborough University Design School. It was later developed at Factum Arte in Madrid for scanning objects of cultural heritage. 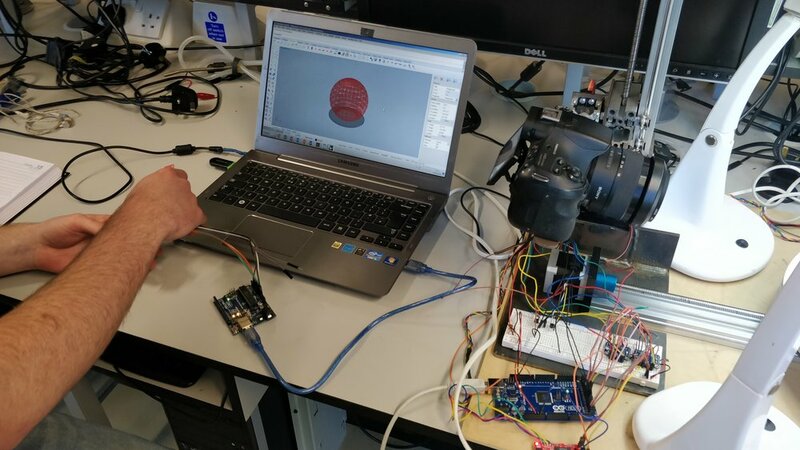 The device works on a technology called Photogrammetry which involves taking a series of overlapping photographs of an object to then be processed by software into a digital 3D model. The product aims to simplify the science of photogrammetry by including the necessary equipment to produce accurate photosets needed for perfect 3D scans. The product features a variable turntable bed and camera height mechanism to achieve a full 360° photoset of the object. A lighting system to provide detailed and true colour textures and an intuitive interactive graphical interface to guide the user through the setup of the machine. The device is aimed at users such as Artists and Designers wanting to share and sell their work online and via social media. E-Commerce sellers, giving customers a more interactive online shopping experience. 3D Artists wanting to create photo-real assets for films, TV, adverts and games. Engineers and makers wanting to retrofit and reverse engineer components. Digital Archivers who preserve the world's history uploading it to the web giving access to historians and students all over the globe. The device is controlled via a series of dials, they are colour coded and correlate to coloured graphical elements on the screen. To set up the device the user supplies basic information about the object’s dimensions and quality of model desired. Real-time interactive graphics on screen help the user by visualising how the machine operates. The device can then work out the camera positions needed for the scan. The quality defined translates to the increments the turntable moves and the amount of height layers, by increasing these a better quality and more detailed model will be produced but the scan will take longer, this is down to the users requirements. The user mounts their camera onto the bracket for scanning. The device connects to the camera allowing settings to be shared between the device and camera such as focal length, aperture and shutter speed. This allows the device to analyse the images for discrepancies such as changes in lighting or sharpness and push modifed settings back to the camera to achieve the best possible photo set. The lighting system comprises of two LED panels with diffusers to evenly illuminate the object whilst being bright enough for high shutter speeds for sharp images. Polarising filters can replace the diffuser to remove reflections on glossy objects which would be otherwise baked into the texture. The light panels are on adjustable arms to enable the user to position them correctly for different sized objects. 8-bit markers on the turntable bed help the software to recognize the scale of the object. By supplying the distance between the markers the object can be reconstructed to real-life scale. This is benefcial for further use of the 3D model in Computer Aided Design or 3D Printing where size and accuracy are important. The user may use their own computer to have advanced control over the reconstruction of the 3D model or the device can store the images and upload it to a cloud service which processes it for them, alleviating the need for computing resources.